1. Information needs to be correct, relevant and practical. 2. Turning this information into action is key! This can only be done by identifying current habits and understanding what it takes to create a new one. Each year, companies invest enormous amounts of money and time into training. But if there’s no conscious effort to address and change the problematic habit, success is not guaranteed. Breaking an unsafe/bad habit and creating a good habit takes time and practice. Even if workers have fully engaged in training sessions and genuinely want to change, the brain is wired to slip back into old ways of doing things. 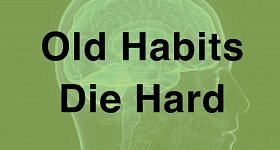 Habits are subconscious and movement patterns are imprinted in our neural pathways.The good news is that habits can be changed with the correct input and effort. Setting your employees up for success means recognising and understanding what it takes to change a habit. Only then can long-term strain related injuries be addressed. Only then can productivity increase. And only then will training programmes be worth the investment!